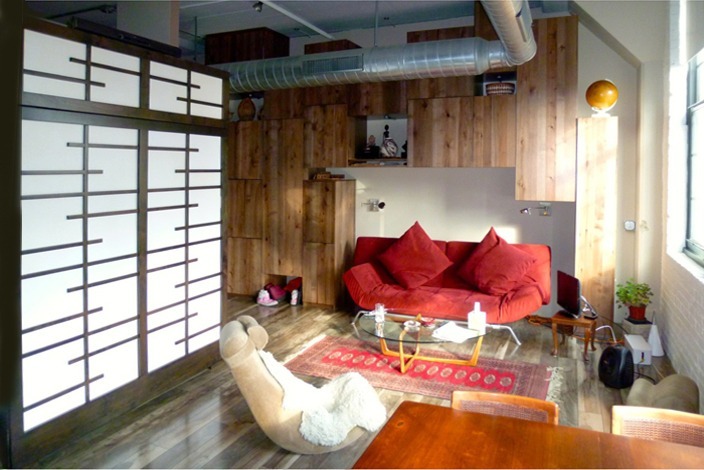 Greg spent some time in Japan and fell in love with their functional rooms. When he bought a condo in a converted casino on North Sierra Street, Greg included us in his furnishings package. Shown here are two SICO Eurobed Extra-long Twins. They are impossible to be seen when stored away. This Cherry and Rice Paper setting features a nightstand and closet next to each bed. Three sliding panels over closet and shelf system. Computer, Television module and Stereo electronic center. 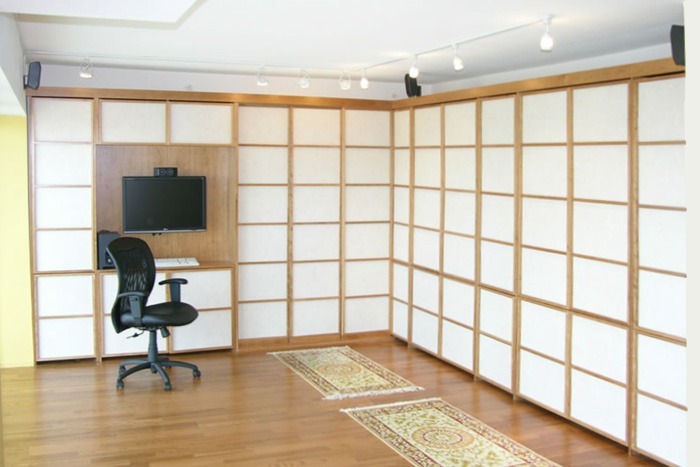 Shoji panels make a room appear larger and brighter! 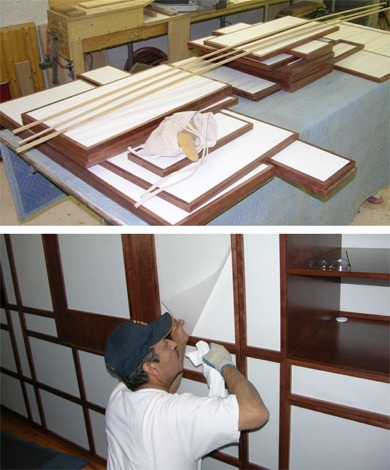 What Makes Your Shoji Bed Exceptional? 1st, we use the SICO system to lift and hide our FlyingBeds. 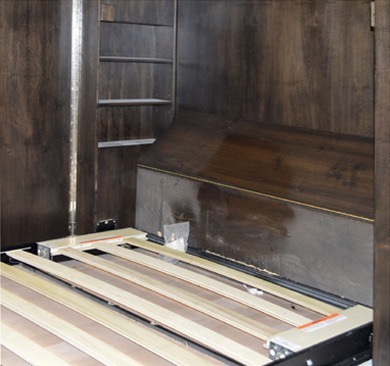 This Murphy Bed system “The Best in the World”. For safety and visual aesthetics, the SICO Eurobed features an hidden-spring mechanism that makes raising and lowering the bed effortless. 2nd, two choices: Real Rice Paper or our “Sorta” Rice Paper. Our Real Rice Paper isn’t that thin stuff; it has a special clearcoat to both strengthen and allow cleaning. 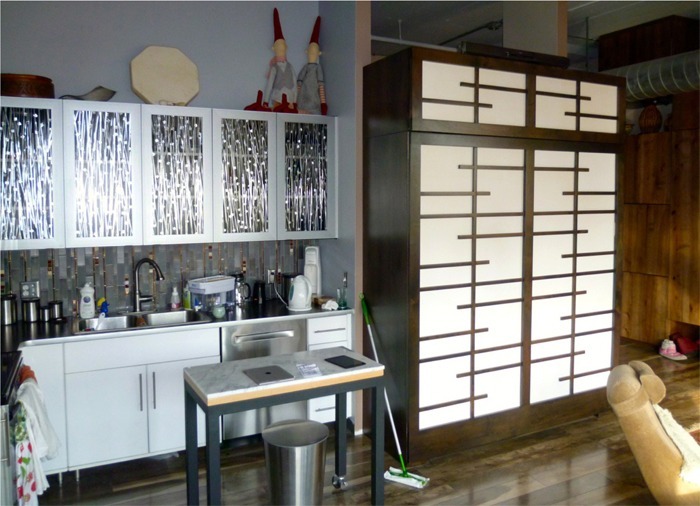 “Sorta” Rice Paper is a Formica-type laminate – some even feel like the real stuff. 3rd, because shadows from different compartments show up behind the paper, we back each panel with a white base material. Otherwise the panels on the bedface would look different than the panels on the drawer faces. . . An extra step in manufacture. 4th, the Cherry wood frame. We use Solid Select Cherry without that “yellow” sap wood streaking that flooring guys say is “the nature of the beast.” We consider it a defect. And lastly, here is the trick we had to learn in making furniture in Colorado’s altitude… A spline that is continuous the entire mitered joint. See that double joint in the corner? We have to “lock down” wood to be stable at 9,000 feet above sea level for our many Rocky Mountain clients. 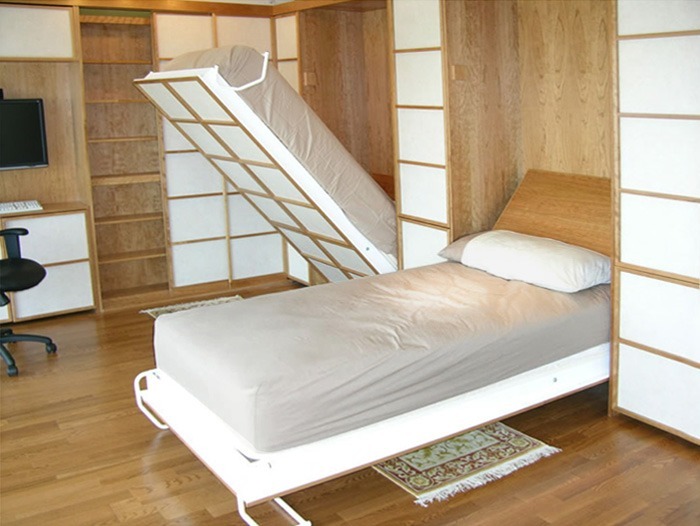 Send me an email to Pilot(at)FlyingBeds.com to start designing your own custom Shoji Disappearing Bed system. 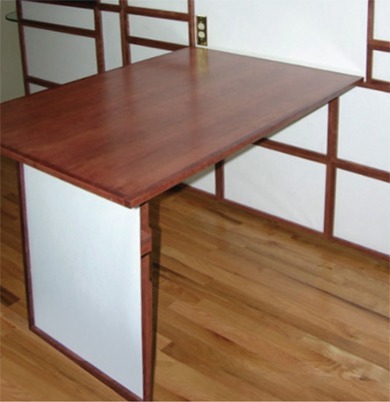 FlyingBeds has another Rice Paper Shoji Bed system that features a table to make the room dual-purpose. This Queen-size bed has a 34” x 42” table integrated into the bedface. 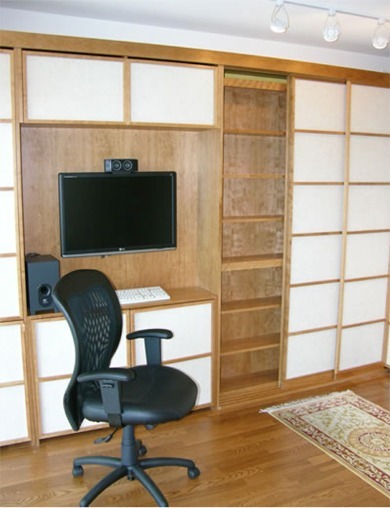 Using a SICO Eurobed Wall Bed System, we made this young man’s room become a bag of surprises. Hidden nightstands. LED lighting. Sloped headboard. 14” thick mattress supported by wood slat foundation. This unit is made with select Cherry and uses real Rice Paper. We wanted to hide the SICO Queen Eurobed and make the kitchen go away at night! Sleeping in a Murphy Bed next to a kitchen can be an experience you really don’t want to repeat. Appliances click on and off. Digital lights make the room seem like morning. Water running in pipes from upstairs neighbors. Here is a unique solution! Make the front of the Shoji FlyingBed Queen become a blocking force. 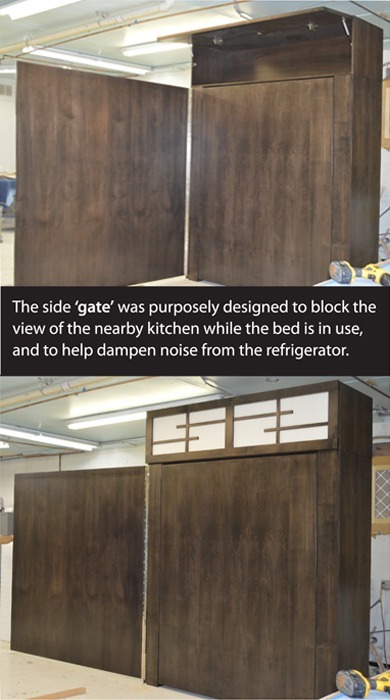 Front panel of bed design hinges around to cut off kitchen noise from sleeping people. 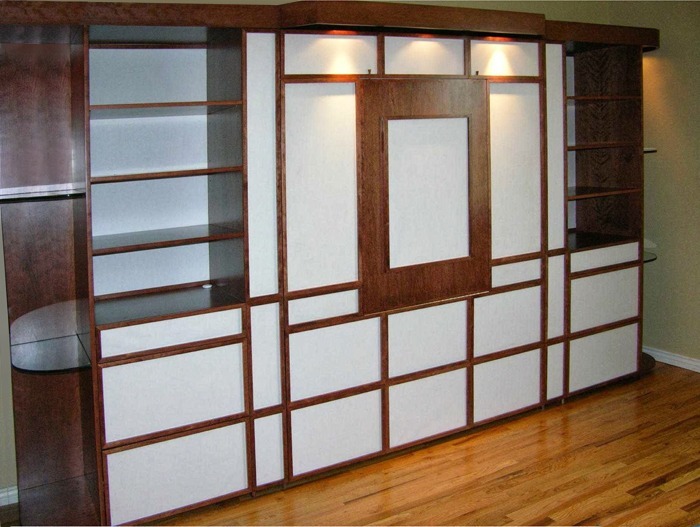 The Murphy Bed shell is Alder finished in Espresso stain and two coats of clear matte lacquer. We even hid two nightstands inside! Overhead storage has ’lift door’ access. 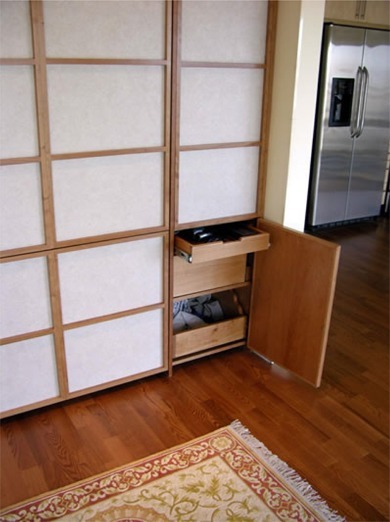 Clever Murphy Bed!